Well fall has finally arrived, at least here in Denver, and while the number of auctions running on Handbid is ramping up quickly, we have not slowed down our feverous pace of launching cool new features on the platform. 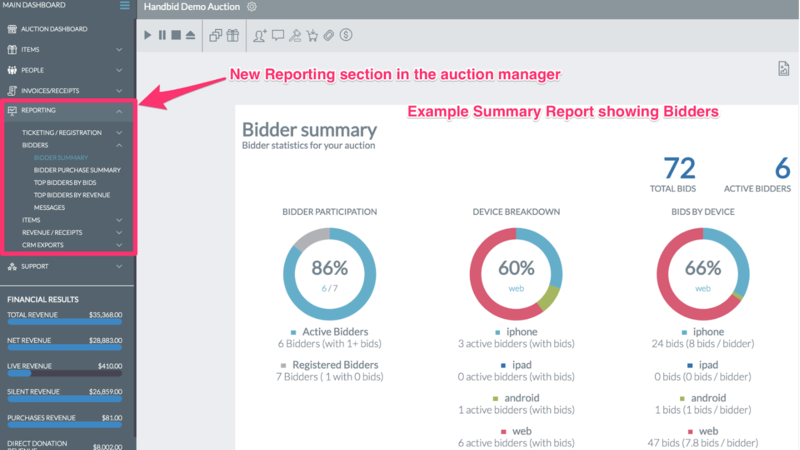 So, once again, we are excited to share with you a bunch of new updates we have made to Handbid, including a major refresh of the user interface and reporting! So let’s dive in! This section has report sections for Ticketing, Bidders, Items, Revenue and exports to CRMs. Each of these sections has reports under them with various reports for each topic. 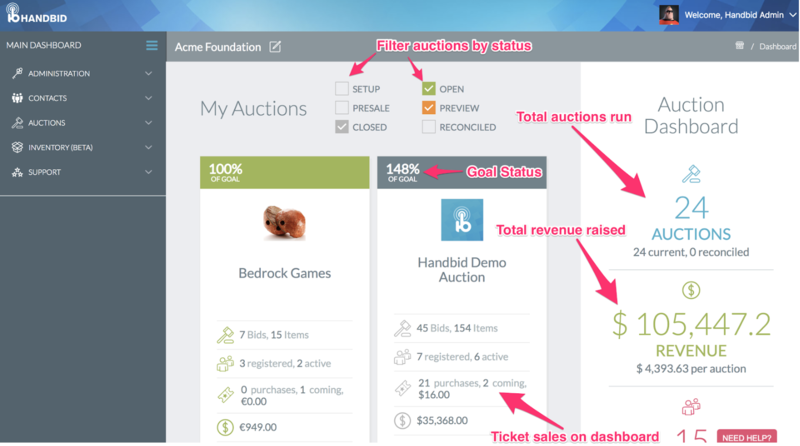 We have updated our auction dashboard to make it easier to filter the auctions shown (and filter out those that are in the past). In addition, we have provided some real-time organizational revenue and auction stats on the right hand panel. We removed the revenue summary in the main window as it was redundant to the Financial Results widget on the left panel. 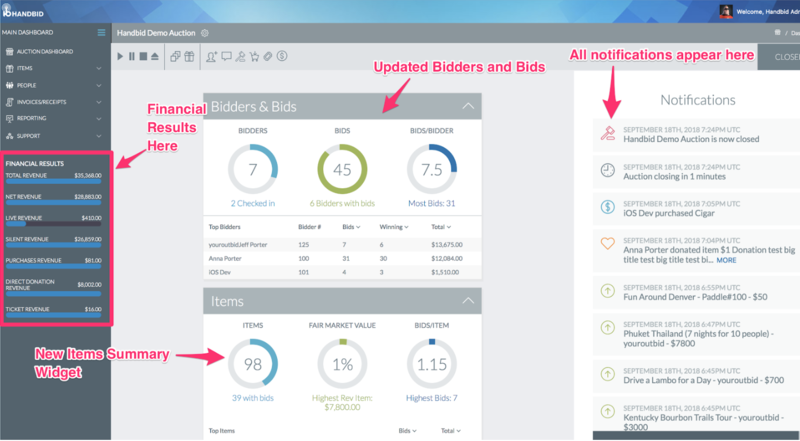 Below Bids and Bidders we added an Item Summary panel showing item revenue performance and top items. Finally, on the right we have a new notifications bin where all incoming notifications go. So instead of incoming bids popping up all over the screen (which is admittedly cool but annoying), they will show up here! For some items, bidders want to know who else has purchased it (e.g. sign up parties). Normally in Handbid, this would require the user to input a display name to replace their Paddle number. Instead, for For Sale items, manager can now set a flag that will reveal purchaser names to bidders. We also changed the “History” tab title to “Purchases”. When you enable this, the purchaser name will appear instead of their Paddle Number. You can show sponsor information in your live activity ticker. 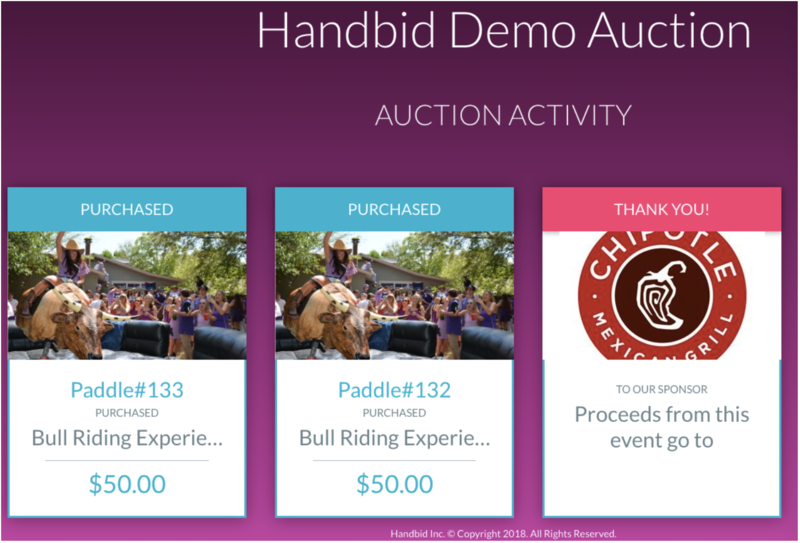 On Handbid TV, we have a cool feature that shows live activity in the auction As bids, purchases, donations and broadcast messages are placed, they appear here in real time. We have now added a feature that will show your sponsors with a special “Thank You” every 5-7 events. This allows your sponsors to get extra visibility during an auction if Handbid TV is running. That is all for this round but expect us to be back in touch soon with even more cool features we have in test. We can’t wait to show some of them to you soon!